Pretty crates are pretty much magic. 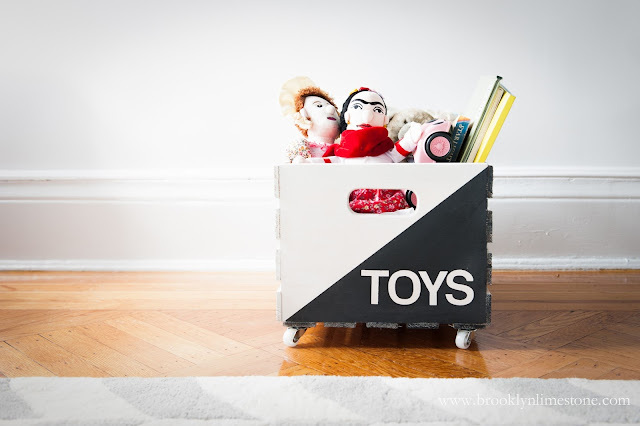 Take a pile of toys (or anything else for that matter) and make it seem like an artful collection. Oh crates, I love you most of all! Materials used: Crate, casters, vinyl letters + paint. Step by step on how I made this rolling storage crate at Snapguide. This is great! Little Riley (our first great granddaughter) is only 11 months but walking. She copies her mom so X they play the pics game. I'll be making one of these for her but maybe with rubber feet for stability right now. We can swap them out for casters later. Thanks, Stephanie!